I'm hoping it's at least lunch made easier. I was reading Becky Higgins' blog the other day and she shared a brilliant idea on how she makes packing school lunches super easy. (Scroll down to #9.) This brilliant idea inspired me to do something similar. I wish I had a drawer available but a shelf in the pantry will have to do. I may need to add another bin. On the bright side I did have to clean the shelf before putting the lunch items in the pantry. 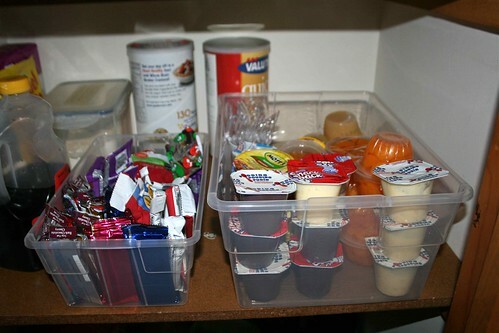 (I hate to admit it, but I've not yet organized the pantry. It's actually a little scary in there. I had to throw out several things that were past the expiration date. Yikes.) Wednesday night I will bag some chips and pretzels for the kids to choose from too. Now I just need to come up with a way to keep the kids from grabbing snacks from this shelf. I'm thinking a loud recording hooked up to a motion detector warning them of the possible punishment they will receive for taking lunch items for snacks. Or how about a laser grid that can only be turned off with a code that only Mickey and I would know? Can anyone hook that up for me? The laser grid would be extra cool.